phil and i were talking a couple of weeks ago about reasons for believing that jesus is god. it irritated me deeply that i couldn’t verbalize my reasons very well, mostly because i feel like i have substantial reasons and i want to be able to tell people, i want the world to know. it needs to get out of my head. so i decided to write it out. its very very long and rambles quite a bit (i have no time or energy for much editing.) so i’m only posting part 1 of 3 which in light of christmas seems appropriate. read if you’re interested. i apologize now for the bad writing..merry christmas. i still have difficulty expressing why i believe that jesus is god because for me its very experiential. for me the question starts with the meaning of the incarnation, and i don’t think that i truly understood this until i experienced the pregnancy and birth of my first child, graciela. i remember when she was in the womb, wondering if she was a boy or a girl, wondering what she would be like. waiting anxiously for her to come out so we could meet her. and there was this feeling that, in a way, this was like a new start for me. she’s half me, has my blood. everything that i had ever messed up in my life now had a new chance. i felt like this was the start of something great, something that was going to change the world. the night before her birth, elisa’s water had already broken, and we were literally just waiting. we listened to sigur ros, elisa slipped into some other holy private reality, peter sat with me on the porch and we recognized how monumental this was. and then it began; something was a brewing. I held my courageous wife and tried to assist her through this deep and holy labor. and then graciela came out after many hours and much pain. this fragile little innocent body dripping in blood and other dirty things. my arms were covered in blood. it was the most surreal experience of my life. i felt like i had witnessed a miracle. it was euphoric. this was new life at its most precious state. at that moment i was filled with more love than probably at any other time in my life, for my bearing wife, for my newborn daughter, for the world.i was living a dream. so how does this connect to the incarnation? well, i would say that something happened to me during this experience. i understood the holiness of birth. i understood the anticipation. i understood the idea that forces were about to collide, that something was in the works that we couldn’t see but that it was going to change everything. i understood the idea of in-breaking and the supernatural breaking forcefully into a reality that we can touch and feel. and not just breaking-in, but changing things, renewing things. i understood new life, both waiting for it and experiencing its glory. i understood the idea that the world, and even my neighbor, is oblivious to the greatness that is about to happen, about how the silence is about to be broken by wonder. and i think that these things are what the incarnation is all about. now, you still might ask, why does jesus need to be god though? how is jesus birth different than any other birth? to that i would say what better way for god to show that he cares about creation and wants to be apart of it than for him to enter into this dirty world like graciela did..to enter into the world in the belly of a fragile pain-stricken woman, to enter into the world as this fragile little human body covered in blood and placenta. birth is dirty and earthy. what better way than for god to become one of us in this fashion, one where the deepest human love abounds, where mother is completely holy, where father is speechless and weeping at the miracle. and this is not only a testament of his care for creation. it is not just a passive example of him connecting with humanity. rather, it is an active, forceful move on god’s part to break-into the world, to bring new life, as a human being..to bring healing. if graciela represented new life as a newborn, then how much more-so god himself. if graciela’s birth felt like a fresh start both for me and for the broken world, then how much more-so the birth of god himself. god entering the world as a baby to be the messiah that would bring healing the nations. how fresh. how glorious. i think that for me alot of it comes back to the idea that i i just thoroughly love the story of the incarnation. i don’t have proofs or anything like that. its a story thats been handed down to me, and from my own experiences of life it just makes perfect sense. i can feel it in my bones and so can many of my brothers and sisters. it empowers me to get up out of bed, to love life, the world, and god. i start my new job tomorrow working as a customer service rep at an inbound call-center. yay…i’m still looking for other jobs, in fact i have another interview directly after work tomorrow.at least this is something. its a little bit of a relief. this job might get us the mortgage. i’m kinda sad because i’m going to miss my family. i’ve seen quite alot of them since we moved here. and also, as usual, i’m kinda freaked out about a new job. i don’t want to go. one of the things that really gets to me is that this “hell of a year” has all happened in the same year that mateo was born, february 18th. what do i with that? i realize that i’ve had very few times of joy with him because i can’t get past what’s going on in my head. i think he deserves better, much better. he needs love, and he needs it from me. i have had this thought many times, but i think that to embrace death in the year of his birth makes his existence a sick joke. if death rules the day then it would have been better for him to have never been born. i want him to enter into a place of peace, love, and celebration; not a war-zone, not a funeral. thats not to say that war-zones and funerals don’t exist, they very much do. but they don’t rule the day. they don’t cripple us. they don’t have the final say. may i embrace life and mateo. but thats enough of that..
oh god..this was supposed to be about my playlist. somehow i think it all connects…maybe… 🙂 and by the way, i think its a damn good playlist. after listening to it i’m surprised at how peppy it is. but you know what, i think its because of the people who have walked beside me on this journey. i listen to it and i think of them and how much i love them, and it empowers me. most (but not all) of the songs are from 2009..close enough. Tom and I ran in the Flying Feather 4 miler race today. My family and my parents came out to cheer us on in the bitter cold. With a # planted on my chest I ran past ohio fields, farms, and some woods along with 2700 other runners, my comrads. 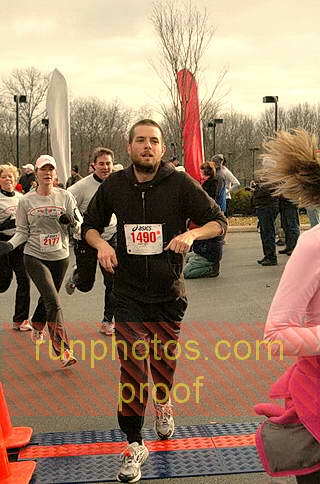 Most of them look ridiculous running, but i have a pretty good feeling that i do as well. we are vulnerable together. although i’m not so sure that they feel vulnerable, so i just went ahead and felt it for each and every one of them, including tom. there’s a whole runners culture that i’m not really comfortable with. its a little dorky…but then again, maybe i am too. note from Elisa: Actually I remembered the camera and then forgot I had it. But I found this online. It’s the cheapy preview since we didn’t buy it. so the other night we were at the wharton jamboree, out at their farm. there were friends, chile, much beer, a bon fire, stars, music, and our friend shawn was in town. we love him. so anyway, we’re all around the fire listening to blake and his band play and i get handed a crying 8 month old male named mateo. inconvenient, right? so i did what any half decent father would do and i walked around and danced with him till he fell asleep. i swayed to the music, holding him tight, with his head on my shoulder, his breathe on my neck. at the same time a girl named graciela was dancing around the fire and chatting with her little friends maggie and finn. and while the band was playing damien jurado’s “ohio” i had a bit of an epiphany. i will have no existence worth living if mateo and graciela are not integrally involved in my life. they make life full and worth living. they bring a deep harmony that is inexplicable. life just seems right. we are apart of something beautiful together. they smooth out the rough places that i tend to think will never smooth. i love them. i guess i’ve realized that before..i mean, i sorta made a documentary about it. but still, it hit me like it was the very first time as i held my son close and watched my daughter. the tears streamed down my face. i told elisa a while ago that i have a love/hate relationship with being a father. there are many many times where it stresses me out, annoys me, i feel like it takes up all my time. i get no introspection. its just noisy, the crying, the whining, the time it takes me away from other people. the time it takes me away from smoking (i didn’t say that). going anywhere is an episode. bedtime is an episode. through the night is an episode. they fight. they get into everything. mateo doesn’t even understand what i’m saying. graciela does and just doesn’t listen. mateo likes the trash can. graciela insists on dressing herself when she can’t do it. yada yada yada. sometimes i just want to go away from it all. i want to check out. but then there are those moments like this one. this epiphany. the irony is that my kids make me want to live. to live with them. to love them. and if i choose to ignore that and to push them away…well then, it will be my loss. raising kids is not easy for me. but these moments make it worth it. and my prayer is that these moments, these realizations, will seep into me on a daily, hourly, minute-by-minute basis so that those annoying times won’t be so annoying. and i’ll be able to see the beauty even in those trying moments..if not, well then, it will be my loss. i was pretty down and out this afternoon. i was sitting despondent on the couch and elisa walks up to me and says the following: “you know, i want you to know that you are my man. i don’t look down upon you. i’m sad with you about this whole thing. but you don’t lack anything.” pretty awesome. this evening i’m listening to depressing music…and all of a sudden elisa and graciela come out dancing as ballerinas with flowing cloth wrapped around their heads…graciela followed every step that elisa made. they moved. they laughed. was it weird? i guess it may sound that way. funny? for sure. pretty awesome? yep. i’m still bummed…but i’ve got some pretty life-giving things to cling to. that i need to cling to. and so i run..i may be able to convince myself that i’m the lamest guy around, but there’s no denying that i am running. my friend tom inspired me. he runs, but he has no aspiration to be the fastest guy in the world. he just does it, loves it, and has been doing it for 2 years. i think its good for his soul. so i started running 3 times or so a week, usually 2-4 miles. and it is good. so good. after the first mile or so of trudging along, sorrow can’t keep up with me any more. i feel the cool air, i see the city, the river, the people, the trees, the trains. i see it all while my legs are moving. and i remember that life isn’t so bad. my life isn’t so bad. everything thats good and decent rolls back into my brain and i love life again.